"Dr. Singh is a great doctor. He is caring, friendly, and understanding." "Dr. Singh shows families that a psychiatrist really can listen and be authentic." "Dr. Singh is great! He's easy to talk to, very helpful, and knows what he's doing." "He helped me through my situation. A very passionate and caring doctor." "I always feel like my issues/concerns are addressed." Gagandeep Singh, MD, is board certified in both child and adolescent psychiatry and general adult psychiatry and takes a personalized approach with all of his patients. With a private practice located in Freehold and Monroe Township, New Jersey, he handles a wide range of mental health concerns, from depression and anxiety to post-traumatic stress disorder (PTSD). Dr. Singh was born in India, but immigrated to America as a young child and grew up in New Jersey. He personally understands the influence culture has on individual issues and communities, especially when it comes to mental health stigmas. Through his medical practice and community involvement, Dr. Singh strives to educate the public about mental health issues, with a focus on the particular needs of the South Asian community. 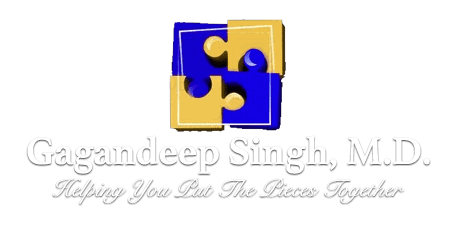 Dr. Singh’s approach is personalized and unique in the in-depth initial assessment he provides, as well as the extended duration of time he allows for each of his sessions. The extended sessions allow for Dr. Singh to better understand the specific needs and preferences of each patient. Each appointment experience is unique and specifically tailored to that specific patient, building a foundation on rapport and trust. Dr. Singh attended Rutgers University on a merit-based scholarship, where he majored in biology and psychology. He earned his medical degree from the University of Medicine and Dentistry of New Jersey (Rutgers University) - Robert Wood Johnson Medical School, where he also completed both his general psychiatry residency and a fellowship in child and adolescent psychiatry. Dr. Singh is a practicing Sikh and speaks four languages: English, Punjabi, Hindi, and Spanish. When he’s not at the office, Dr. Singh enjoys sports, cultural dances, poetry, writing, and stage performances. These are Dr. Singh's thoughts about the work he is fortunate to do, in his own words. "The practice of Child and Adolescent Psychiatry, as well as Adult Psychiatry, is as exciting as it is varied. This specialty is truly one of the last bastions in modern medicine that allows the practitioner to 'connect' with the patient, and one where the value of the patient's input is not underestimated. You can read my blog to understand my thoughts on the importance of the doctor-patient relationship and providing mental health services to society as a whole, as well as specific barriers faced by the South Asian community." "Understanding the impact of one's life experiences, and the interaction with a person's biology and temperament is an art that few have the opportunity to practice on a routine basis. A careful evaluation can reveal several areas of focus for medication and therapy during the treatment of the individual. It is this art that defines the profession of Psychiatry - especially Child and Adolescent Psychiatry." 2007 Young Investigators’ Poster Presentation at the American Psychiatric Association Annual Conference - San Diego, May 2007: Prevalence of Osteoporosis in SPMI Patients. Dr. Singh has been named a New Jersey Top Doc based on patient feedback and accolades! ""I have been a patient of Dr. Singh since age 17 (23 now). He is professional and compassionate, and a one of a kind practitioner." "Dr. Singh is a very knowledgeable and patient provider. He takes the time to listen before providing feedback. I would highly recommend Dr. Singh. " "Dr. Singh is an excellent doctor. He actually takes time to listen to you and doesn't rush you out of his office." "Dr. Singh is the best doctor I've ever had. Very professional yet relatable. Very good guy, knows his stuff and always puts his patients first. Highly recommended." "He is very attentive and will take the necessary time to get all the information. He is thoughtful about getting to the root causes of the issues." "I have had a great experience with Dr Singh, I will continue to refer him."